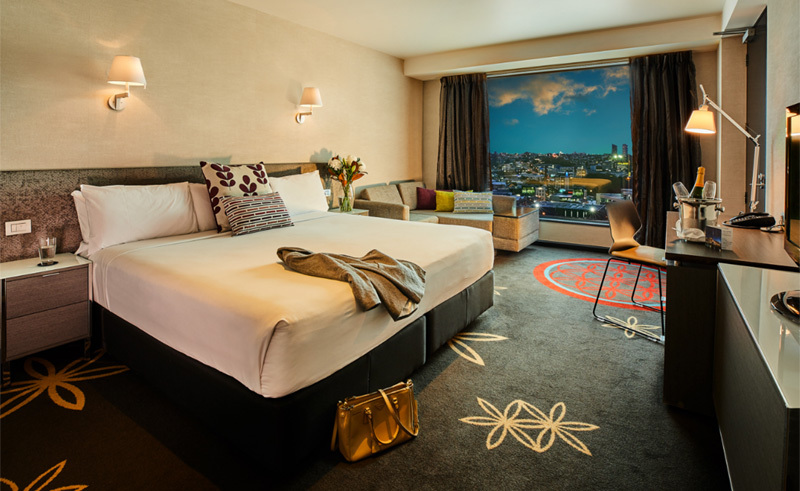 One of New Zealand’s most popular hotels, the 325 room Skycity Hotel offers a wonderful place to relax and unwind in the heart of Auckland. Rated 4-star plus and including spectacular views across the city, you can enjoy all the luxury and comfort of a first-class hotel with spacious rooms and all the facilities you’d expect of an international hotel. The hotel’s 12 restaurants and bars feature a series of extensive menus that range from traditional New Zealand cuisine to Spanish and Mediterranean Tapas and Yum Cha and Cantonese cuisine. Its most famous restaurants are dine by Peter Gordon which is a chic, elegant and award-winning restaurant with a unique blend of Asian, Pacific and traditional European cuisine; the Grill by Sean Connelly whilst the Orbit Revolving Restaurant is very popular for its amazing views of the City of Sails whilst you enjoy some fine New Zealand food and wine. Each hotel is marvellously appointed with free WiFi, TV, iron & ironing board, refrigerator, tea & coffee making facilities and en suite facilities with hairdryer. Escape to New Zealand’s majestic North Island and discover the island's history, culture and beautiful scenery.